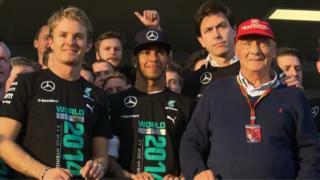 Mercedes' non-executive chairman Niki Lauda says the team's first constructors' championship victory is an "emotional moment". Lauda believes Russian Grand Prix winner Lewis Hamilton now "looks good" for the drivers' championship after winning his fourth race in the row, while Mercedes' motorsport director Toto Wolff also gives his thoughts on their title win. Mercedes has amassed 565 points and clinched the manufacturer's title with three races of the season remaining.